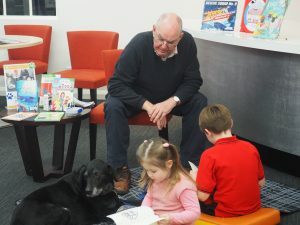 Why a reading dog: Tezza was training to be a guide dog but developed a skin complaint so he decided he'd like to hear stories and help kids read. 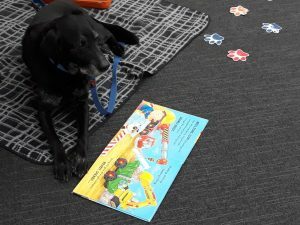 He enjoys being at the library and listening to stories so much he has been a Reading Dog for 5 years. Favourite snack: I'm a Labrador I like everything, Dad (my owner Greg) gives me. I especially enjoy the liver treats I get after each story that is read to me at the library. Do you think your dog could be a library reading dog? We are looking for some new doggy volunteers. Email us to express your interest and receive more information.